So, let's continue the inadvertent Mexican fiesta we have going on here from our last post, shall we? 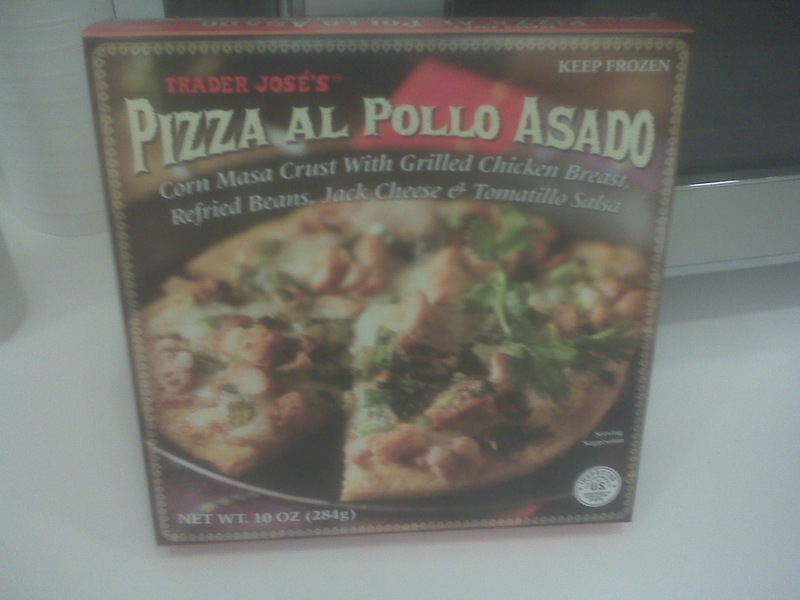 A few weeks, maybe a month ago, Sandy and I picked up a pair of these Trader Jose's Pizzas Al Pollo Asado with the intention of each of us taking one to work for lunch so we could each give it a try and then write a review. I ate mine a day or two later. Sandy's pizza? It sat...and sat...and sat...and sat in the freezer. For weeks. I've written before about her tendencies to do such things, and like other times before, finally today I snatched it for lunch at work again. Considering the past couple days we've been too busy to shop and I've had a bag of vending machine pretzels for lunch, I think that's okay. I really don't think she can mind it that much...hmm, indeed, right as I was typing this, she walked in from a night out with the girls, saw the empty box on clear display next to me on the couch, and she neglected to say anything about it. I think I'm in the clear. And, well, I should be, because honestly, while the pizza was okay, I was reminded today that it looks a lot better than it tastes. I mean, look at it, with its big, thick crust loaded with chicken, beans, cheese, and salsa verde. How can it be bad? Those are some of my favorite things. Problem is, even for a pasty white Pennsylvania Dutch boy like me, I know how good and tasty and vibrant authentic Mexican food can taste from my two trips to the country. This...isn't quite there. First, the corn masa crust. Think of a cross between a corn tortilla and a semi-soggy chunk of cornbread, and that's more or less what it tastes like. In its defense, though, at work we have only microwaves, and I know that's a terrible way to "cook" pretty much anything, but that's what we (and pretty much everyone except home ec teachers) have at work to prepare food. I guess it'd be better from an oven. Still, not that great. The chicken, cheese, and beans? Indistinct, I'd say. I mean, it tastes okay, but it all melds together. At least it's real chicken bits, and a good number of them, too. The tomatillo salsa, however, is pretty good - really good, even, especially because there's a pretty legit kick to it here and there - but there's not nearly enough of it for my taste. I tend to like salsa overkill, though, so it may be sufficient for some folks. Overall, I think it's on the verge of being better. Some more spices and flavors could really help set it apart. For one thing, I'd think some more lime flavor could go a long way. Trader Jose sneaks some in with some ever-so-delicioso sounding lime juice powder, but I didn't taste it, and found myself wishing I had some fresh-cut wedges to squeeze out over the pie. A little of that, and a little more of whatever Mexican spices make authentic dishes so intoxicatingly good, and definitely some more salsa verde (and chiles in the salsa), and this is much closer to being a pretty respectable quick-bite-for-a-gringo dish. It's shame in a way, too, because it looks so good that it's disappointing to me at least when the flavor just doesn't quite deliver. The pollo pizza also dampened my spirits when I was reading the box at work, and it mentioned how great it'd go with some cold cervezas...I don't think I could get away with that at work, Jose. Don't tempt me. In trying to be fair, I've found myself wondering about my rating all afternoon. It's frozen from a box, so of course it can't be as good as the real thing, and when you can actually taste the salsa, it's really good. For a $1.99 work lunch, though there's much better options, they're not absolutely horrible. However, in addition to flavor issues, like pretty much any prepared microwavable things, well, assume what you will about the nutritional facts, and you'll be right. I settled on between a 2.5 and 3 for them, so one of each, por favor. I enjoy this inexpensive treat. I cook it on a pan with a little oil and it comes out just fine. try it again at home in an oven... i've cooked one that way after it being in the freezer for about 2 weeks or so, and it was delish! I agree with your rating, and making it in the oven isn't much better. The 'crust' is still soggy and while the seasonings are good, there's just not enough of them to go around the wee pizza. The instructions, on my "pizza" at least, said to "heat directly on oven rack" at 400°. An utter disaster: the cornmeal (that's essentially what it is) literally disintegrated in my oven, leaving me with an hour-long cleanup. While the combination of ingredients looked good, did anyone -- anyone at all -- at TJ's try actually following the heating directions before selling this? I was so upset that I don't even remember what the remnants tasted like -- although I remember thinking that there was waaayyy too much corn "crust" for the mild toppings. Kind like a flat, will-not-hold-together tamale. Ugh, chidino. Sounds like a terrible experience. I thought I just had a semi-subpar lunch..sounds like you had it far worse. I first saw these guys in the store back in the spring. Then they were actually gone for most of the summer due to a product recall. Nothing horrible; the packaging just didn't mention that they were made in a facility that had processed nuts or something. I've bought four or five of these in total. Slightly annoyingly, every one of them suffered from uneven topping distribution, the jalapeños in particular were always clumped in the center. Nonetheless, I find they make a pretty tasty snack. I've never trusted putting anything directly on my oven rack. Baking sheet has always worked fine; for slightly better results, put the baking sheet in the oven while it preheats, then put your pizza on the already-hot baking sheet. Awesome website! I agree with your review, looked much better on the box! They have some other amazing pizzas thought. Had this lastnight and it was horrible. Not only that but trying to scoop it out of the toaster oven, the entire thing fell off the rack. I think I need a new toaster oven now. Yuck. 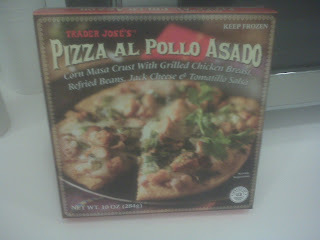 I don't know why I keep expecting trader joe's frozen food to be any good. It's awful. I have thrown away several meals. The only thing that's decent is the brown rice. It's my first time trying this product. Do not follow heating instructions on its box!!! Corn masa crust doesn't hold up. It made a mess in my oven. It taste awful too. You end up eating crust (cannot even call it crust) with refried beans, nothing else. If you are lucky you probably get two very small pieces of chicken. I'm not going to buy it again. Just had this pizza and was excellent! But, I used my pizza stone and disregarded the instructions. Rule 1 of pizza stone - cook high and rule 2 - watch it, don't time it. I cooked on pizza stone lowest rack at 425 and think I cooked it for about 25 - 30 minutes. I also added some extra cheddar on top. It was rather tasty with a little sour cream! Ehh, it wasn't just the microwave that was the issue. I made mine in the oven and it was not my favorite. I usually love almost everything from trader joe's, but this one definitely disappointed me. I followed the instructions and heated it in my toaster oven. It was just awful. Tasted primarily of beans over mush. Crust is soggy and ingredients are poor quality. Never again.